Why do you weave in your ends away from the steek centre? 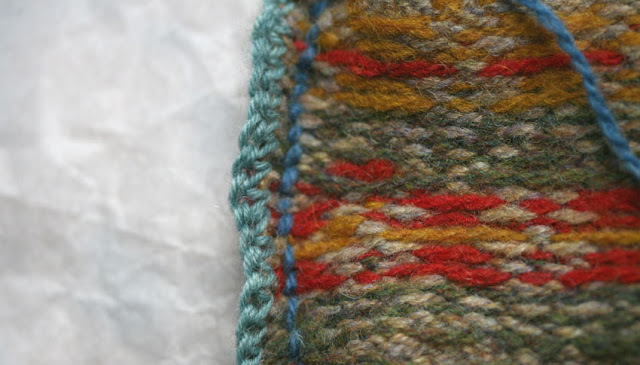 This is just a personal thing: I know that many knitters recommend just leaving the ends in the middle of the steek (as everything will be trimmed later), but I personally don’t like to do this. I want the back of the work to be as clean and firm and stable as possible before I begin the crocheted reinforcement. When one is working the crochet, one is poking and re-poking one’s hook through the fabric, pulling up yarn from the back of the work. It is all too easy to catch one or more of the hanging ends, and get oneself in a wee bit of a tangle. Also, in the pattern I’ve just written, the start of the round is one stitch to the right of the five steek sts. I find that it makes things much easier and simpler to just weave in all the ends off to one side, away from the steek stitches, before I start to crochet and cut. Would you recommend blocking before steeking? I tend to give the front and back of the work a quick steam before steeking (with an iron on the wool setting, without touching the fabric) just to allow it to relax. I don’t recommend blocking any more vigorously than that – if the stitches are stretched significantly before you work the steek, then they will be more likely to want to pop out of the crocheted reinforcement. (I have seen this happen . . . AIGH!) You can give your garment the full blocking treatment when you have finished it completely, with the steeks properly secured. . .
How about working with heavier yarns? My new cardigan pattern is actually knitted in a worsted / light aran weight (can you guess which yarn I’ve used?!) My samples (and those of the test knitters) used sock yarn and a 3mm hook to crochet the steek reinforcement, and this worked really well. With all yarn weights I would definitely recommend using a finer, strong yarn that won’t snap, and a smaller hook for your crocheted reinforcement. Does it matter what colour yarn I use for the crocheted reinforcement? I used yarn in a contrasting colour for illustration purposes. I would say that, just as if you were sewing an invisible hem on a skirt with needle and thread, that it is probably best to use a yarn that is quite close in hue to the main colour of your garment. If (for example) you were knitting a white cardigan, and used black sock yarn for the crocheted reinforcement, then you would definitely run the risk of the reinforcement showing through between the stitches of the sandwich edging. Where precisely do you pick up the stitches to work the edging from the right side? I’ve worked quite a few of these ‘sandwiches’ now, and I would say that for the neatest result (ie, for the edging to sit properly flush against the main pattern), you should pick up your stitches in the gap between the outermost steek stitch and the first stitch of the main pattern. 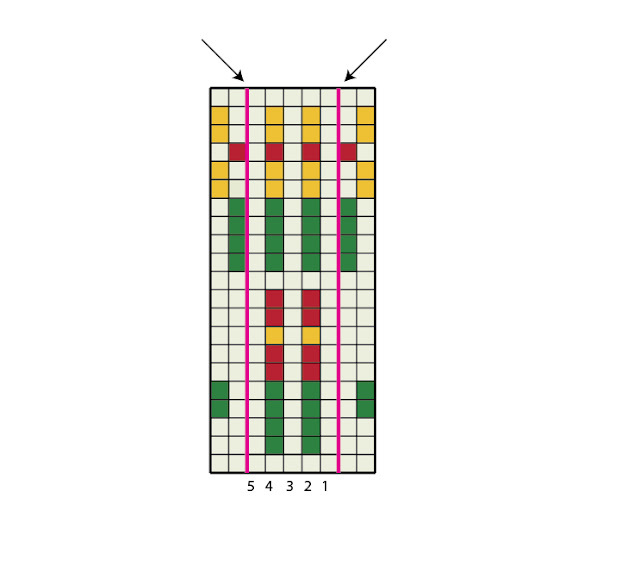 See the diagram below: there are two pattern stitches on either side, and five steek stitches in the middle. You pick up the stitches along the pink lines. Several of you asked this question, so I’ll add this diagram to yesterday’s sandwich tutorial, to clarify things. In relation to picking up the stitches from the right side, and my instruction to “make sure you push your needle all the way through to the back of the work, and draw the yarn through from the wrong side,” Donna asked: “are you creating new stitches thru the knitting rather than picking up stitch from the front ie the already knitted stitches?” The answer is: YES. It is is necessary to pick up through the fabric to get this effect on the back of the work. This is the usual way in which I pick up stitches and it is clearly not everybody’s way (which is why I mentioned it). And in relation to the moot “fence post” issue Lynn raised in her question, logic would indeed suggest that there should be one less loop on the back of the work than the front but . . . having made multiple sandwiches, I have honestly never noticed this. I always check that the number of stitches is the same for back and front needles before beginning to knit them together and it always is… I have been told by my knitting buddies that I pick up stitches in an “odd” way, and I generally begin the process by attaching a slip-knot loop to the back of the work before starting to pull the yarn through. . . perhaps this provides me with an extra stitch? Your thoughts are welcome. How do you work an i-cord bind off? This is a very simple (albeit time-consuming and yarn-greedy) bind off. It is probably my favourite finish for a cardigan edge. Cast on 3 stitches using cable cast on. *k2, k2tog tbl. Slip 3 stitches from rh needle to lh needle. Pull the working yarn across the back * Repeat from * to *. At final 3 sts, finish by k1, k2tog tbl, slip 2 sts to left hand needle, k2tog, pull yarn through. The result is a neat, raised, corded edge. How does the sandwich facing relate to the button bands? The beauty of this method is that the sandwich is the button band! You’ll see precisely how when I show you some photos of my new cardigan (hopefully tomorrow). Another fantastic thing about the i-cord bind off is that it allows you to create neat, integral buttonholes (by binding off a couple of stitches in the normal fashion, and working a couple of rows of plain i-cord over the top of the gap). It is (of course) an EZ method, and I use it on my Manu design, as well as on the new cardigan. It is by far my favourite buttonhole. Could I use a different bind off? Yes, of course. Use any method you like. For example, you could simply complete the sandwich by grafting or working a three-needle bind off when you are knitting the back and front stitches together. I am intrigued by the Dale-of-Norway three-needle bind off / picot facing method that Lisa mentioned in her comment. It sounds lovely – I will have to try it. Could I knit the loops of the crochet reinforcement together with the back and front stitches? I’d say not. You do not want to put any strain at all on that reinforcing chain. If you tug or pull at it in any way then you run the risk of the cut edges popping out. Don’t do it!